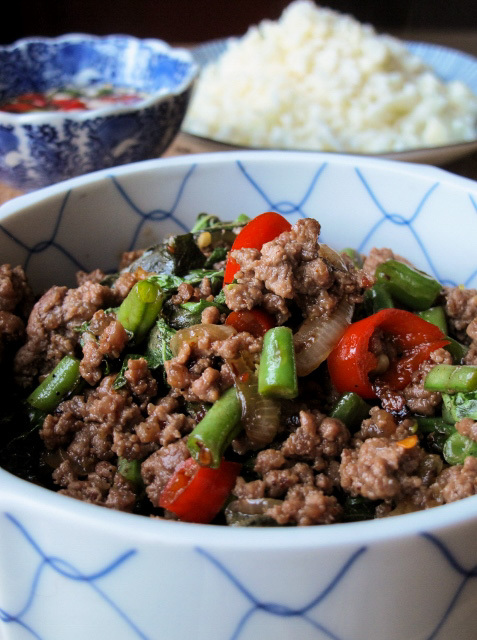 Quick and tasty, phat kaphrao (Thai Beef Mince with Basil & Chilli) is a great dish for anyone who wants some authentic Thai flavour in a hurry! Unlike many other classic Thai dishes, phat kaphrao takes mere minutes to whip up and doesn’t require more than a couple of Thai ingredients, making it a great lunch option or a simple addition to a larger meal. The real stars of the show are the basil and chilli so it doesn’t really matter what your protein of choice is when making phat kaphrao. Whilst this particular version of the dish uses beef, you can also make it using minced pork or chicken – it really just comes down to your preference and what you have lurking in the fridge at the time. Personally I prefer making it with beef as I find chicken and pork mince can be a little dry – something that the beef’s fat content seems to negate, so don’t use extra-lean mince when making this dish. If you are going to use minced chicken just make sure that it’s made with some dark meat and not just chicken breast. But back to the all important basil and chilli. Firstly don’t be shy when adding the basil – use lots…and then add a bit more! I’m of the opinion you can never have enough basil in phat kaphrao! Another thing to bear in mind is that not all basil is created equal and it is important that you use the right kind in the right dishes. Whilst similar to Thai basil, sweet Mediterranean basil isn’t really a good substitute in Thai dishes as it’s far too ‘soft’ to withstand intense cooking and surrenders its flavour all too readily. Admittedly Thai basil isn’t always easy to source so I suggest growing a plant in your garden – it is easy to grow and you’ll have an abundant supply on hand whenever you need it. Whilst it’s an integral part of the dish’s flavour, the amount of chilli you chose to add to your phat kaphrao comes down to personal preference and tolerance levels. Like most Thais I love my chillies, but I prefer to err on the side of caution when adding them to the dish as the heat of chillies can be notoriously unpredictable. Instead I prefer to serve the bulk of the chillies on the side (chopped and steeped in white rice vinegar) which allows you to add as much heat as you are in the mood for. Marinating is truly one of the greatest forms of culinary alchemy. Like turning lead into gold, a good marinade can be equally as magical, morphing even the most mundane into something utterly delicious in a matter of hours. However, perhaps the best part about marinating is the transformative affect it can have on cooks, having the ability to turn novice kitchen dabblers into proficient cooks overnight! A fool-proof way of jazzing up a couple of tiresome skinless chicken breasts, this Thai inspired marinade is both quick to make and requires only a few basic pantry ingredients. However, as easy as this recipe is, the marinade does require one thing and that’s enough time to work its magic. Personally I would leave the chicken to bathe in the marinate overnight, as this will give the meat fibres enough time to break down sufficiently and for the flavours to penetrate right through the chicken. If you really are rushed for time then a few of hours will suffice, but it will be to the detriment of the final result. 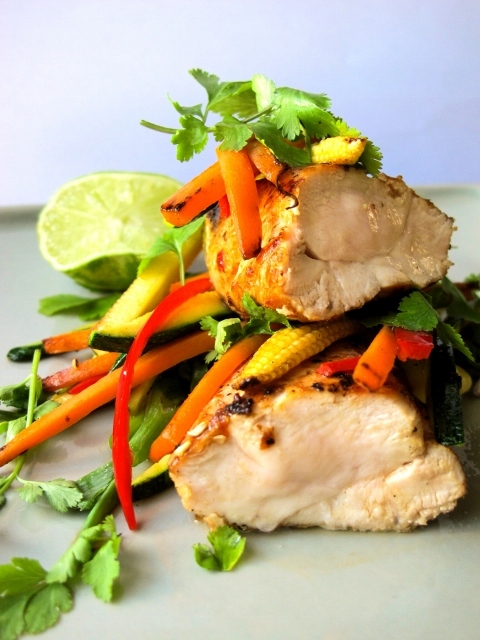 While far from authentically Thai, the coconut and lime marinade does impart a taste of the Orient whilst still being mild enough to appeal to most tastes, making a good mid-week family meal or something slightly different to serve at a braai/BBQ. Cooked, cooled and then thinly sliced, this chicken also makes for a wonderful sandwich-filler or salad-topper. However, my favourite way of serving it is with a massive pile of stir-fried julienned vegetables, making this the perfect Banting/LCHF dinner option. This marinade’s versatility isn’t, however, limited to the ways in which it can be served, as the marinade can also be used on just about anything. Whilst I’ve used skinless chicken breasts for this recipe, the marinade would work just as well with any other chicken pieces, pork or fish. If you are going to try it with fish though, I would recommend using a firm white fleshed fish and restrict the marinating time to no more than an hour. Caramel is something that most of us associate almost entirely with Western cuisine, more specifically with Western-style desserts, but the use of caramel is, in fact, common in Asian cooking, especially in those countries that formed part of the colonial Indochina region. In Vietnam, Cambodia, Laos and, to a lesser degree Thailand, the use of caramel sauce is fairly routine and is considered a pantry staple, added to a wide range of dishes. 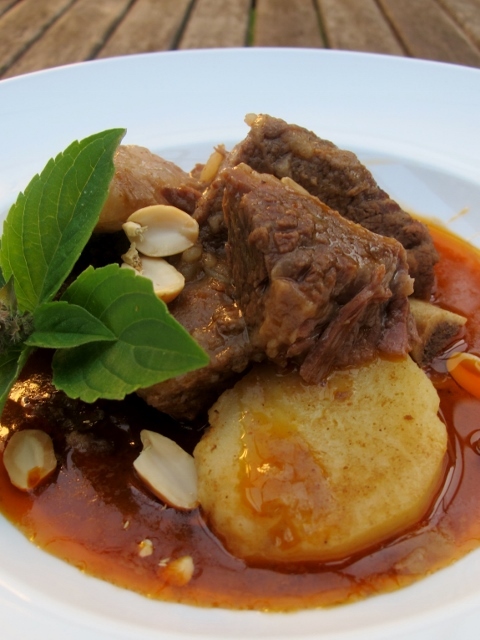 The caramel sauce enriches the colour of the dish and imparts a sweet, smoky undertone. The Vietnamese, in particular, are especially fond of this ingredient. Known as Nước Màu, some of Vietnam’s most popular dishes rely heavily on its inclusion – Bún Chả and Thịt Kho Tàu being prime examples. Whilst its use is not as prevalent in Thailand, cooking with caramel is not uncommon in Thai cuisine, although typically the flavour is achieved through the caramelisation of palm sugar and not the use of a ready-made caramel sauce. Sweet meat dishes in Thai cuisine are considered the perfect foil to sharper, acidic flavours, as well as creamy coconut dishes – the classic pairing of Shredded Candied Pork, Coconut Rice & Green Papaya Salad (Som Tam) being a case in point. This heavenly balance of flavours is not, however, solely restricted to this classic combination and is something that should be considered when planning any Thai meal. This is where Thai Caramel Pork (Muu Waan) comes into its own. 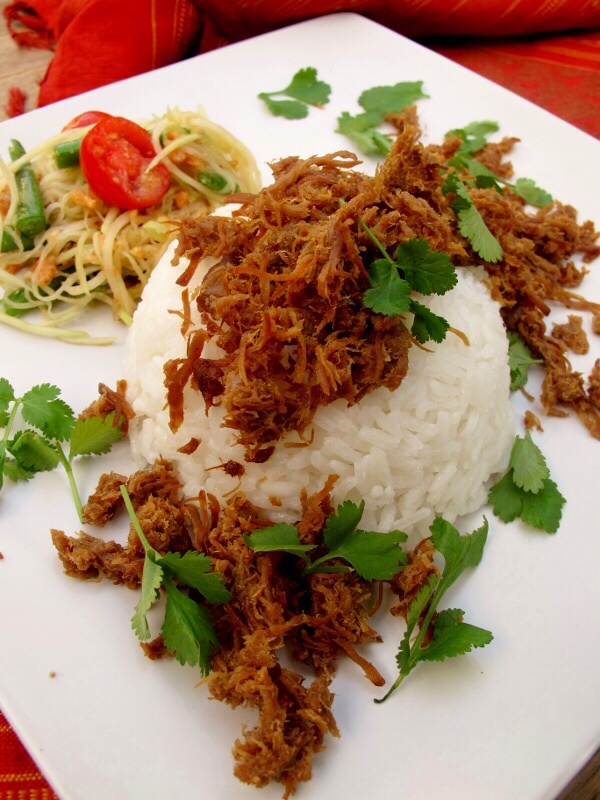 Similar in flavour to Shredded Candied Pork, Thai Caramel Pork is in fact far quicker to make and is less labour intensive and can be used as an alternative to the shredded variety in the classic combination mentioned previously. Personally I like to pair Caramel Pork with a coconut-based dish such as a Mussaman or a Green curry and a zingy yam (Thai Salad). I am especially fond of serving it with either a simple Fried Egg Salad (Yam Khai Dao) or Waterfall Beef Salad (Neua Naam Tok). Regardless of what you decide to serve it with, provided you cover the trifecta of Thai flavours (sweet, sour and rich), you’ll be onto an absolute dinner-winner! Unless you are a Buddhist monk, you are unlikely to ever encounter truly vegetarian food in Asia and like most other regional cuisines, Thai food is no exception. Thai Salads (or “yam” as they are known locally) are often spiked with a sneaky portion of dried shrimps or the meat-to-vegetable ratio is often skewed in favour of the meat. Ask for a salad in Thailand and chances are you’ll be served something as far removed from what you imagined a salad could, or should, be. That said, yams are utterly delicious and make an essential addition to any Thai-style meal. Aside from my obsession with the classic Som Tam (Green Papaya Salad), one of my favourite yam is Waterfall Beef. Often the first thing people ask about is the dish’s name. “Waterfall” seemingly conjures up evocative images of cascading falls in a topical paradise. Sadly, however, the truth is far less poetic, as the “waterfall” actually refers to beef juices that drip from the meat as it is cooked over hot charcoal. Traditionally Waterfall Beef is eaten with sticky rice, but it also offers a wonderful counter-balance to other, richer Thai flavours, especially when paired with a classic Thai curry like mussaman or green curry. Whilst simple to make, Waterfall Beef is not without its pitfalls. Firstly, the steak must never be done past medium-rare and must be afforded enough time to rest before being thinly sliced. Secondly, the salad must be served immediately as the acidity of the dressing will “cook” the beef if left to stand too long. Another thing to consider is the ratio of herbs to meat in the dish. Don’t be shy with the herbs as they are what makes this is a salad – they are not there as a token garnish. Aim for a 40/60 ratio in favour of the beef. 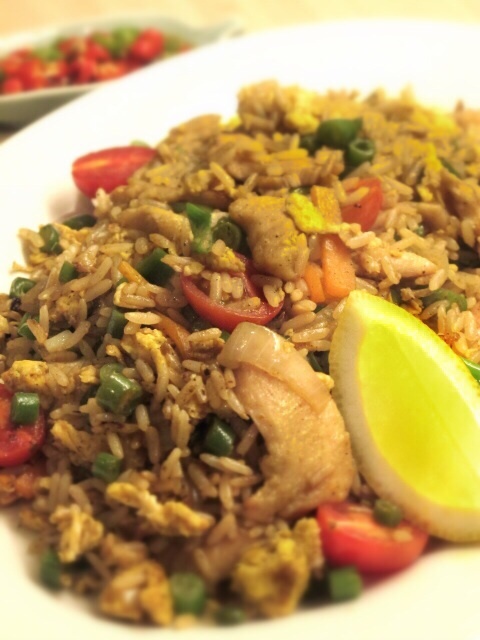 A perennial takeaway favourite in our household, Thai-style Chicken Fried Rice (Khao Phad Gai) is one of the few dishes that both my partner and I enjoy eating, albeit with a few differences in our taste preferences. Naturally I like mine hot and spicy, whereas my partner’s is a somewhat more muted affair without any chilli or garlic. To my mind, the lack either of these elements seems like an affront to Thai cooking, but each to their own, I guess. Along with an obligatory side order of Tom Yum Goong, Khao Phad Gai has a special place in my recent food history. It may be a simple meal, but this takeaway (along with a lot of red wine) was an absolute Godsend during a particularly stressful house-move – something I will forever be grateful for. Ordered almost every other night, we would sit, wine in hand, in amongst our half-packed boxes watching episodes of “Orange is the New Black”, tucking into our Khao Phad. None of it may have been very classy, but for a short while at least, this became our new normal. Almost a year later, we don’t order Khao Phad as often as we did back then, but we still enjoy eating it now and again. After a rather disappointing order, though, I decided to try my hand at making it myself. Personally I prefer my own efforts, but my partner thinks otherwise. Apparently my version is “too flavoursome” for his delicate tastes – in my book that can never be a bad thing! As I said before, each to their own. As with most Asian food, the key to success is preparation…and a hot wok. Typically, 90% of any Asian stir-fry is prep-work, as the actual cooking usually takes just a few minutes – so make sure you have all you ingredients chopped and ready to go. Stir-frying can be fast and furious, and you don’t want to be faffing around with a carrot while your onions burn! There are some dishes that are just meant to be eaten together, their combined flavours amounting to something akin to culinary kismet – this is such a meal. Eaten on its own Moo Wan is almost unpalatably sweet, but when served with som tam (green papaya salad) the results are nothing short of stellar! Add coconut rice to the mix and you simply have heaven-on-a-plate. As with so many Thai classics, the key to the success of the overall meal is the balance each individual element strikes when combined. The sweet moo wan counters the tang of the salad, the coconut rice envelopes the fierce chilli kick of the som tam, whilst the salad adds texture and bite; every element has its own role to play in creating the perfect balance, resulting in an almost perfect Thai meal. Whilst the idea of making the three separate dishes for this meal may seem daunting, the truth is that individually they are actually pretty easy. 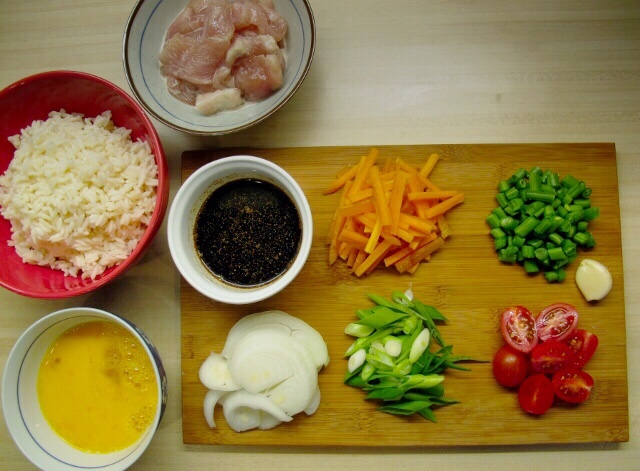 The trick to preparing multiple dishes for any Asian meal is preparation and timing. The moo wan will keep in the fridge for a good few days, so I would make this in advance if possible. You should start cooking the coconut rice at least 40 to 50 minutes before serving, as it will benefit from being allowed to stand for half an hour after cooking. 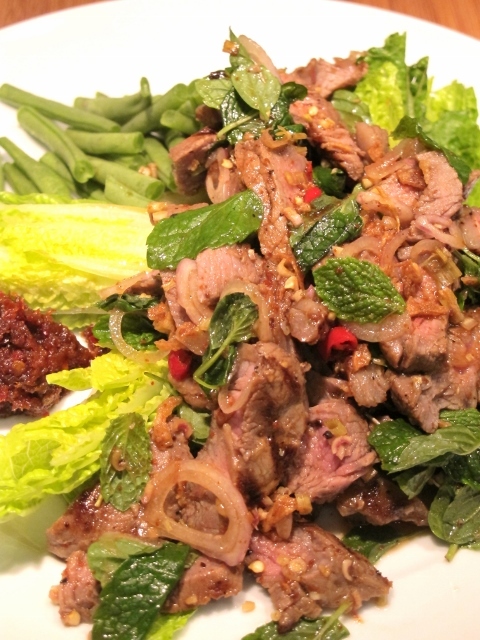 The som tam must be prepared just before serving, so I recommend prepping your ingredients in advance. However, the papaya should only be shredded just before using. 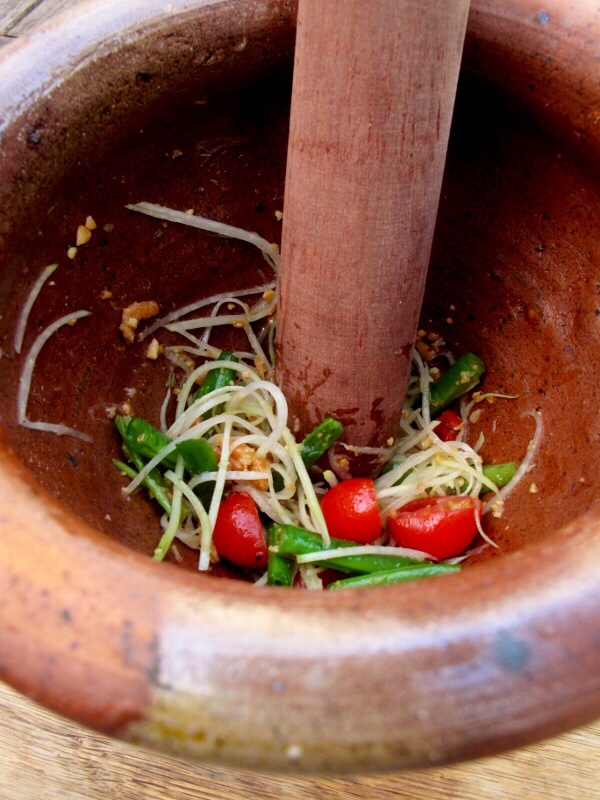 To find out how to make som tam (green papaya salad), please click here to find the recipe. Mussaman Beef Curry is my personal favourite of all the conventional Thai curries that we know and love; I find it has a depth of flavour that is sometimes absent in other Thai curries. In particular, the aromatics in this recipe give a smoky edge to the sauce that takes the curry to a whole new level. 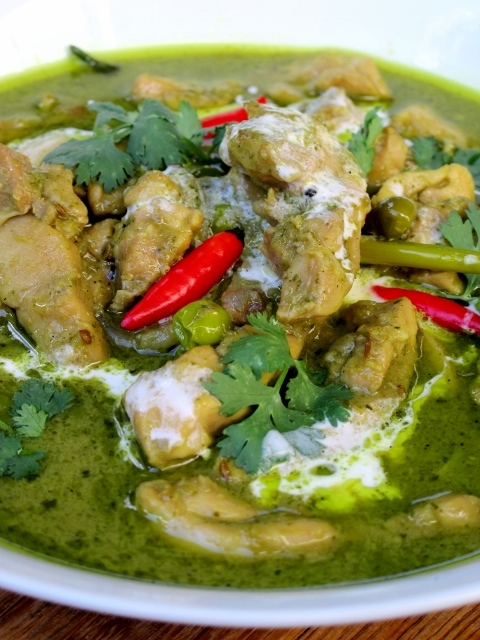 The irony about this particular mussaman curry recipe is that it’s actually adapted from one by a television chef who thoroughly irked me for turning his nose up at ready-made pastes, but I must confess that I found his technique for making of this curry surprisingly authentic. Nevertheless, I still felt the need to tweak it here and there. Of course his version requires the “essential” homemade paste made out of 14 additional ingredients, my does not. Both versions taste wonderful, but only one takes half the effort and expense. I’m Asian and I know which one I’m calling my own.